The ancient Greek astronomer-astrologer Hipparchus in the late 2nd century BC introduced the Vernal Point (VP) as the calibration technique for the astrological ages based on the VPs position among the zodiacal constellations. The VP is the position of the Sun at the vernal equinox around 21st March each year. Hipparchus commenced the tradition of calibrating the astrological ages based on the location of the VP in one of the 12 zodiacal constellations. This is a mathematical technique as it is not possible to actually see which constellation the Sun is ever located within as it is always daytime when the Sun is visible. The above illustration shows the Sun rising at the vernal equinox on the 20th March 2016 in Baghdad, Iraq (in deference to the Sumerian and Mesopotamian astronomer-astrologers who defined the zodiacal constellations thousands of years ago). The inclusion of the zodiacal constellation boundaries is for reference purposes. The constellation of Aquarius sits well above the horizon and the Sun is located in one arm of the constellation of Pisces. The constellation boundaries are irrelevant for astrological purposes as they have been defined by modern ‘pagan’ astronomers. Furthermore there is no evidence the ancients had constellational borders. The real estate style subdivision of the sky into constellation is a modern phenomenon. Based on Hipparchus’ system, the above indicates the world is currently in the Age of Pisces. The VP has been in the constellation of Pisces for two thousand years or more and remains in the constellation of Pisces. This is why most astrologers claim we remain in the Age of Pisces. Most research astrologers accept the zodiacal constellations as symbolic markers only for the 12 sidereal signs of exactly 30 degrees each. The sidereal zodiac was invented by the ancient Greeks (or Babylonian astrologers) to tidy up the zodiacal constellations in their evolving practice of horoscopic astrology. Unfortunately for astrologers over the following period (equivalent to the length of an age), Hipparchus failed to realize that the old zodiacal constellations had a much older method of calibration. The older method of calibrating the zodiacal constellations is a visual technique. All old astronomical techniques were visual—mathematics took an insignificant role in ancient astronomy. Hipparchus did not use the ages-old visual technique as he was obviously transfixed by the new mathematical techniques developed in his era. I am much indebted to a paper by Rumen Kolev—Some Reflections about Babylonian Astrology. In this paper, Kolev explains the five basic principles applied to ancient astronomy techniques in Babylon. In summary, three of these principles state the visible light directly received from a stellar object was of primary concern, as the ancients believed “God is Light.” In those days, the view of the heavens by the unaided eye was the only method of determining astronomical phenomena. The other two principles are that the two key times for astronomical observations are around Sunrise and Sunset. In ancient times, the telescope was preceded by the line of the horizon and Neugebauer states that Babylonian astronomers were mainly concerned about astronomical phenomena on the horizon. For example, a major Babylonian text dated 1400–1000 BCE supplies the heliacal rising dates of thirty-four stars and constellations according to their 360-day annual calendar. In ancient Upper Egypt, the heliacal rising of the star Sirius marked the beginning of the year. The heliacal rising of a star or planet is its first appearance on the eastern horizon in the early morning sky just before the rays of the Sun obliterate the stars from the night sky. The term “heliacal rising” unfortunately has different interpretations. The definition of the “true heliacal rising” is when a star or planet, etc., rises with the Sun but because the Sun is visible the planet or star cannot be seen. This is the ‘mathematical’ system employed by Hipparchus as the position of the Sun in a constellation must be calculated. The alternative to the “true helical rising” is the “visible heliacal rising” when a star or planet, etc., can be seen on the eastern horizon just before the approaching sunlight obliterates the star or planet from view. My use of the term “heliacal rising” refers exclusively to the visible heliacal rising. In most ancient societies, the visible heliacal rising (or setting) of a stellar object was one of the most important calibration techniques applied to a stellar object. The “true” heliacal rising technique is a ‘modern’ mathematical technique probably invented by Hipparchus. The ancient Greek author Hesiod, a contemporary of Homer, mentions the heliacal risings of the star Arcturus and asterism, the Pleiades, as if the reader of his times clearly understood what he was talking about. To many ancient people, the heliacal phenomena of stars and constellations were an integral part of their calendar. In practical terms, the heliacal rising of a body occurs about one hour before Sunrise, but this will vary with latitude, season, and the brightness of the bodies involved. Rumen Kolev also states the heliacal rising (or setting) of a stellar object must occur before the Sun rises (or after it sets) which is another way of saying the “visible heliacal rising”. Gavin White in his book Babylonian Star-Lore proposes the most relevant astronomical feature of ancient times (presumably other than the position of the Sun and Moon) were the stars on the eastern horizon just before dawn. White goes further and claims that the first star maps were actually a calendar in the sky, with the equinoxes and solstices as the reference grid for the calendar. In the earliest times of civilization, mankind referred to the stars in their heliacal mode with a specific focus upon the two annual equinoxes and solstices. Their New Year, commencing at the spring equinox, elevates this point above the autumn equinox and two solstices. This ancient view of the cosmos is basically in agreement with my approach to the astrological ages based on precession. The modern approach to calibrating the ages using the Vernal Point developed by Hipparchus is incongruous to the original methods of observing the stars and constellations. This incongruity of using the position of the Sun at the vernal equinox as the calibrator for the astrological ages is put into context by Nicholas Campion, who states that in observational astronomy it makes no sense to place the Sun in a constellation or among stars, because whenever the Sun is visible the stars are not. Observational astronomy was the astronomy of the ancients. Elementary astronomy provides the reason why my rectification of the ages is half a sign in advance of the accepted norm amongst astrologers until now – it is because the commonly accepted ages based on the VP are half an age late! The VP is located at the Sun’s position on the vernal equinox (around 21 March each year). 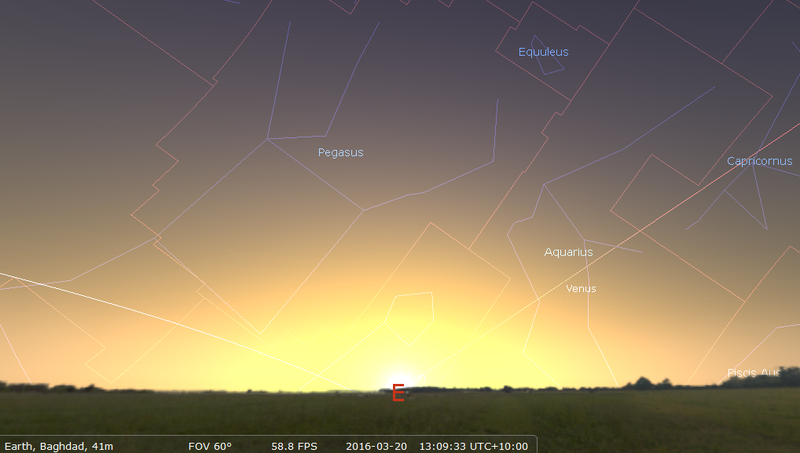 The heliacal zodiacal constellation is viewed approximately one hour before the Sun rises. As students, most of us are taught the Earth rotates on its own axis once per day, and all 360 degrees rise above the horizon in twenty-four hours. Therefore, in two hours, on average, thirty degrees (or one zodiacal sign) will rise up over the horizon. In one hour, approximately, fifteen degrees of the ecliptic rises—this is equivalent to half a zodiacal sign. This is the source of the discrepancy between the ages as defined by Hipparchus and the ages based on the ancient visible heliacal method. The difference between the ancient techniques of the heliacal rising zodiacal constellation at the VE compared to the modern VP method is approximately fifteen degrees, half a sign/age or about 1,075 years. In ancient times, the zodiacal constellations were meant to be read via their visible heliacal position when applied to the astrological ages. The error Hipparchus made in 127 BCE when he inadvertently used the VP in place of the visible heliacal method delayed his ages by approximately 1,075 years. I am not the only researcher who acknowledges the heliacal rising of the zodiacal constellations at the spring equinox as the astronomical framework for the ages. The archeo-astronomer Sepp Rothwangl in Considerations About the Start of the Age of Aquarius claims that, in ancient times, a new constellation rising on the eastern horizon before Sunrise on the morning of the Northern Hemisphere spring equinox was the main criterion for the start of a New Age. Rothwangl also states that such a change from Pisces to Aquarius has already occurred, thus indicating the arrival of the new Age of Aquarius. 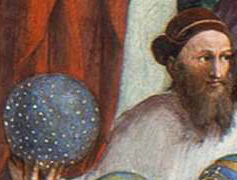 Hipparchus suffered from a calibration error when he applied the VP method to precession and astronomers and astrologers have adhered to this erroneous VP calibration technique ever since. If the ancient heliacal method is applied to the zodiacal signs, a very different time frame is provided compared to the Vernal Point method. For example, in 2016 at the vernal equinox, the Sun (VP) sits in the constellation of Pisces, though the constellation of Pisces cannot be seen. The Vernal Point will remain in the constellation of Pisces for many more centuries. However, if you are awake one hour before dawn, when the stars are still visible on the eastern horizon, the last stars seen rising up from the eastern horizon before the sky turns blue is the constellation of Aquarius. 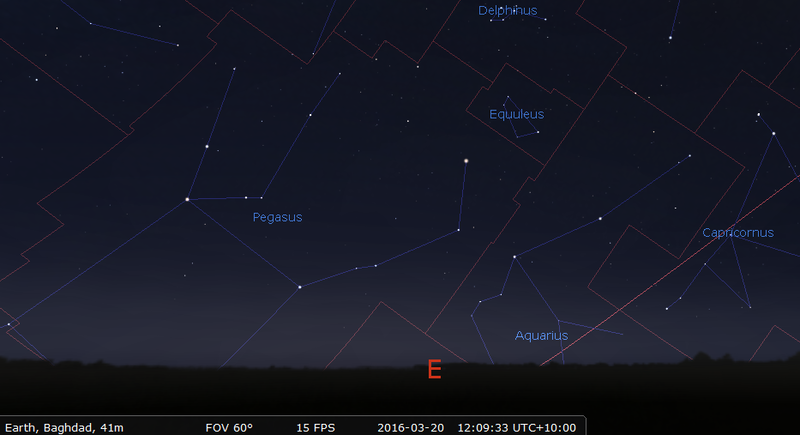 The above illustration one hour before dawn on 20th March 2016 in Baghdad shows the constellation of Aquarius sitting just above the horizon with no stars visible in the constellation of Pisces. Therefore, the constellation of Aquarius is currently the visible heliacal rising constellation. The constellation of Aquarius has been the visible heliacal rising constellation for centuries. The conundrum is that, based on the Vernal Point located in the constellation of Pisces, we are supposedly in the Age of Pisces and will remain so for many centuries while based on the visible heliacal rising of the constellation of Aquarius, we are in the Age of Aquarius and have been in the Age of Aquarius for centuries. The latter assertion is substantiated by historians who claim the arrival of Modernity occurred about 500 years ago. It is one thing for an astrologer-astronomer from over 2,000 years ago to make a mistake, but to not correct this mistake at the first opportunity is another massive mistake by astrologers.